The Hestia operated six squadrons at the time of its deployment from Scorpian Fleet Shipyards. Three strike fighter squadrons numbering twenty ships total, and divided between Viper Mark VIIs and Raptors. One tactical reconaissance squadron, and one electronic warfare squadron, both numbering twelve Raptors each, and one training squadron numbering twenty Viper Mark IIs. 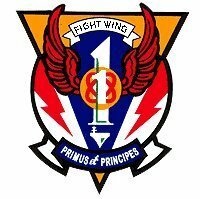 The 11th Fighter Wing has been in existence since approximately twelve years prior to warday, in various configurations of squadrons and Commanding Officers. In its present configuration, the wing was set up for reconaissance and early warning; its missions frequently took it beyond the armistice line, prior to the holocaust of the twelve colonies. The Commanding Officer (CAG) of the 11th FW is Captain Karim "Spider" Marek. GOLD SQUADRON: Strike Fighter Squadron 195 (VFA-105), also known as the "Gunslingers." This squadron was originally comprised of 16 vipers, and 4 raptors in a support capacity, and currently numbers 8 vipers and 4 raptors. BLACK SQUADRON: Strike Fighter Squadron 13 (VFA-13), also known as the "Furies." This squadron was originally comprised of 16 vipers, and 4 raptors in a support capacity, and currently numbers 10 vipers and 3 raptors. SILVER SQUADRON: Training Squadron 41 (VT-41), also known as the "Red Aces." This squadron was originally comprised of 20 vipers, and currently numbers 16. BRONZE SQUADRON: Tactical Electronic Warfare Squadron 77 (VAQ-77), also known as the "Wardogs." This squadron was originally comprised of 12 raptors, and currently numbers 8. BLUE SQUADRON: Strike Fighter Squadron 61 (VFA-61), also known as the "Spartans." This squadron has become defunct due to attrition, and its remaining crew has been dispersed amongst the active squadrons. GREEN SQUADRON: Tactical Reconaissance Squadron 17 (VAQ-17), also known as the "Knights." This squadron become defunct due to attrition, and its remaining crew has been dispersed amongst the active squadrons. Tankers – The Hestia operates two refueling tankers (modified Raptors) from its Flight Deck. These pilots report directly to the CAG for all tasking and operations. They fall under the command of the 11th Fighter Wing, not an individual squadron. Shuttles – The Hestia also operates two shuttles (modified Raptors) from its Flight Deck. These pilots report directly to the CAG for all tasking and operations. They fall under the command of the 11th Fighter Wing, not an individual squadron. Viper Pilot: These officers operate the Hestia's strike craft, which form the bulk of a battleship's front line defensive and offensive capability, including close air support and limited ground support. As commissioned crew members, they are held to the same standards as all other officers and are skilled in both piloting the Viper as well as operating its guns. Some may have skill in on-the-fly repair. Raptor Pilot: These officers operate the Hestia's support craft, whose duties include Search and Rescue (SAR), Marine fireteam deployment, countermeasures, ground support, stealth and reconaissance missions, and transport amongst others. While not front-line fighters, Raptor Pilots must be able to operate under any and all conditions, whether in the midst of the fray or out of range of air support, most often without defensive capabilities other than the craft's FTL drive and jamming capabilities. As commissioned crew members, they are held to the same standards as all other officers and are skilled in piloting the Raptor. Some may have skill in on-the-fly repair or operation of the Raptor's various Air to Ground (ATG) weapons, and some are cross-trained in rudimentary ECM operation. Electronic Countermeasures Officer (ECO): These officers operate the electronic equipment in the backseat of a Raptor. As commissioned crew members, they are held to the same standards as all other officers and are skilled in using the craft's countermeasures suite, which includes jamming, deploying chaff (decoys), operating the FTL drive and operating the various sensor packages. Some may have skill in on-the-fly repair and most are cross-trained in rudimentary piloting of the Raptor, in the case of an emergency.